I recently purchased a used Dell PowerEdge server for home lab use and ran into a serious issue when trying to start it up. 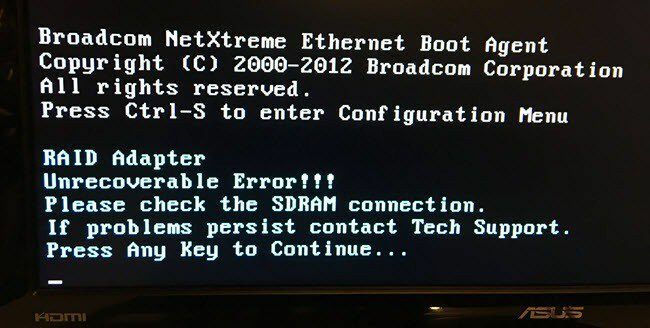 During the boot process, the server would give me an error message when it got to the RAID controller. Adapter at base not responding - No adapter! At this point, I would press any key to continue and the boot process would continue normally. Unfortunately, since the RAID controller was not working, it didn’t find any of the hard drives either. The boot process would end with a No boot device available message and press F1 to retry reboot, F2 for system setup or F11 for BIOS boot manager. So what are your options here? Well, since it’s obviously related to the RAID controller, there really isn’t any reason to reseat the CPUs or memory chips. As long as the boot process is able to configure the memory and find the processors, they should be OK. The first thing you’ll want to try is to reseat the RAID controller card. Now the process of getting that card out is a little tricky. Basically, you’ll notice that one side of the card has a blue tab and the other side has a black tab. The black tab goes all the way to the back of the card. You’ll have to pull the back part of the black tab off the back of the card so it’s not holding it in place anymore. 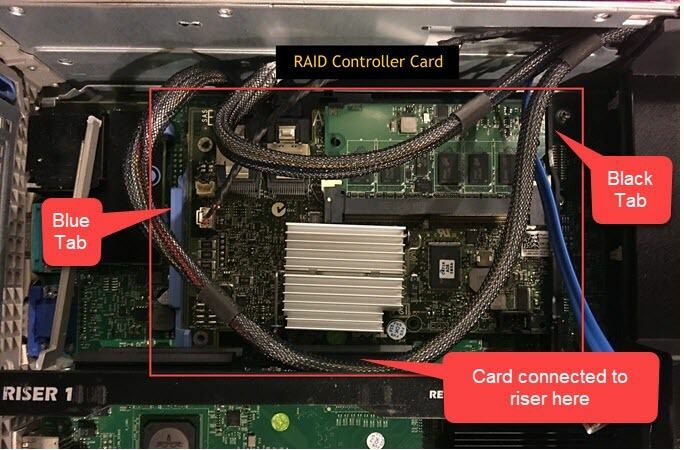 I also pointed out where the cache card is located on the RAID controller. 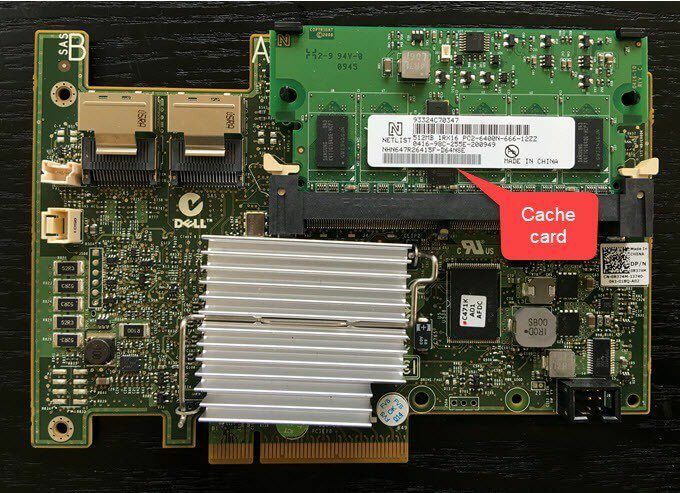 If you have an extra cache card, you can always try replacing that first before replacing the RAID controller. For me, once I pulled out the RAID controller and booted up the server, I didn’t get any error message during the boot process. This told me there was a problem with the RAID controller and I had to replace it with a new one. When replacing the card, make sure you slide the card into the black tab groove first and then into the blue tab groove. Once it is in the grooves and aligned with the connector, then push it in. After that, you can reconnect the two data connectors and the one power cable. Try to reboot and hopefully everything loads up fine. On my server, I got a refreshing working message when I booted up the server after replacing the controller card. This time it was able to find all the SAS drives on the server and eventually booted up into my Windows Server OS. Unfortunately, if you’re getting this error, there really isn’t much else you can do other than replace the cache card on the controller or replace the entire controller card. If you have any questions, feel free to post a comment here. Enjoy!